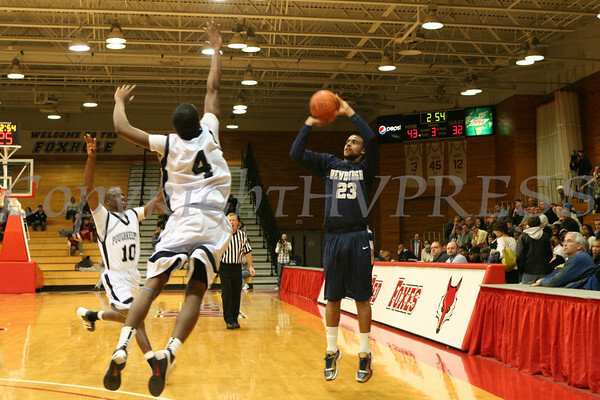 Newburgh Free Academy took on Poughkeepsie in a non-league game at Marist College in Poughkeepsie, New York on Monday, January 3, 2011. Poughkeepsie defeated NFA 69-58. Newburgh Free Academy Goldback Will Williams (23) nails a 3-pointer in the third quarter as Poughkeepsie's Elijah McLaurin (4) and Ronnell Epps (10) defend during their non-league game at Marist College in Poughkeepsie, New York on Monday, January 3, 2011. Poughkeepsie defeated NFA 69-58. Hudson Valley Press/CHUCK STEWART, JR.